287 years ago this month, (12 July 1730) marks the birth of Charles Darwin's grandfather, English potter Josiah Wedgewood. He founded the company that still bears his name, a name that has become synonymous with the iconic blue with white bas-relief cameo-themed jasperware pottery. What is less well known is that the style was developed over several years by Wedgewood in an attempt to copy a particular ancient glass object, now called the Portland Vase. This piece was and still is regarded by many as the pinnacle of ancient glass art. The vase was made around the time of the birth of Christ and shortly after the invention of glassblowing. The prevailing theory states a dark, cobalt blue vase was blown and then coated in a second thin layer of white glass. The piece was then carefully sculpted, probably by a gem carver, by grinding the white over-coat glass into various mythological scenes. The figures stand on dark blue ground that was revealed by completely grinding away areas of white, leaving only the under-layer. Both theories have their points, and the wide differences only serve to emphasize how little we actually know about ancient methods and technology. Having said that, the alternate theory, it seems to me, has an up-hill battle to gain acceptance over the prevailing one. What is especially revered by aficionados, and gave Wedgewood the most trouble in replicating, is the delicate carving of the white glass. The figures depicted around the vase in various scenes are not monochromatic, but expertly shadowed just like a fine painting. This, it is commonly thought, was achieved by grinding the white glass so thin that the dark blue under-layer starts to show through, making gradations of lighter and darker features. A face or a hand was shaded by making the white glass slightly thinner on shadowed areas. Wedgewood's solution was to subtlety tint the white clay he used, which was then applied to a blue clay vessel and fired in a kiln. One of his early successes, owned by Darwin, can be viewed at the Victoria and Albert Museum in London. Today the original Portland Vase can be viewed at the British Museum where it has taken a place of pride almost since the museum’s inception. A series of unfortunate accidents and one act of intentional destruction have broken the vase several times, but it has been painstakingly pieced back together and restored so that cracks are minimized. One of these events occurred during the Roman Empire, when the bottom of the vase was replace by a circular medallion of the same style cameo glass. 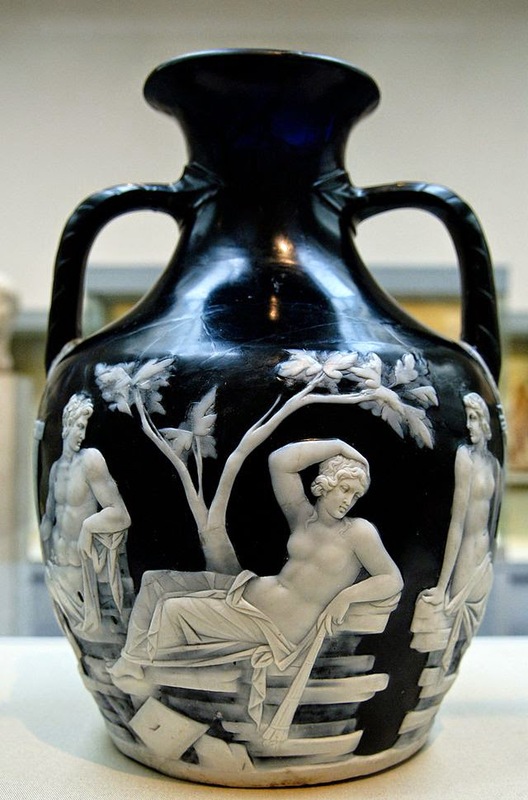 In modern times, the vase was the subject of a nineteenth century contest, with a prize of 1000 pounds, to make an accurate reproduction in glass. The winners of that contest were glass blower Philip Pargeter and engraver John Northwood. Their piece is on display in the Corning Museum of Glass in New York. The vase was uncovered in the late sixteenth century during an excavation, when the hunt for ancient tombs around Rome was in full swing. It was presumably used as a funerary urn in what, at the time was thought be the tomb of Emperor Alexander Severus. It's first owner after discovery was none other than Cardinal Francesco Maria del Monte, patron of the arts, alchemist, glass collector and Medici family confidant, of whom I have written here before. The cardinal was a lifelong advisor to Don Antonio de' Medici, who was in turn, the patron of glassmaker Antonio Neri. There is every chance that Neri and Del Monte knew each other, although no such record has yet been found. Del Monte is known to have visited the Casino di San Marco in Florence at the time that Neri was making glass there and Neri is conjectured to have visited Rome a couple of years earlier. If Neri the priest was ever granted audience with the cardinal in Rome at his main residence, the Palazzo Madama (now occupied by the Italian Senate), it is easy to imagine a tour of the cardinal’s extensive glass collection, which he displayed in a special room dedicated to the purpose. 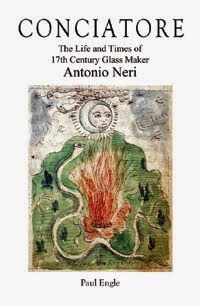 Such a tour would not be complete without an examination of what would become the most famous piece of glass in history, the Portland Vase, by the man who would become the most famous glassmaker in history, Antonio Neri. "Go ahead, take it – hold it up to the light."